How fast will my trawler go? What is my optimum speed? How far can I travel and how much fuel will it take to get there? All of these are obvious questions to answer when you acquire a trawler. One of the first things we recommend that you understand about your trawler is your underway performance. Each trawler has a number of factors that influence speed through the water and it is not as simple as, for example, driving a car. When we drive on land we push our foot on the accelerator, look at our speed in miles per hour, stay in our lane and ideally stay close to the posted speed limit. We monitor our fuel gauge to determine when we need to refill. There are many more considerations with a trawler. Diesel engines require hands-on attention to fuel management, and you are operating in a floating environment where weather can have a dramatic effect on your ride and performance. Underway there are some slow speed areas in protected waters (no wake zones), but there are no speed restrictions once you get offshore. Closer to shore there are channel markers to mind, but once you get out in the open the only restrictions after following the right-of-way rules are based on fuel consumption and comfort of the crew. Two trawlers that are the same exact model may have different performance characteristics based on fuel quantity, equipment load, cleanliness of the underwater surfaces, engine alignment, shaft friction, propeller trueness, etc. 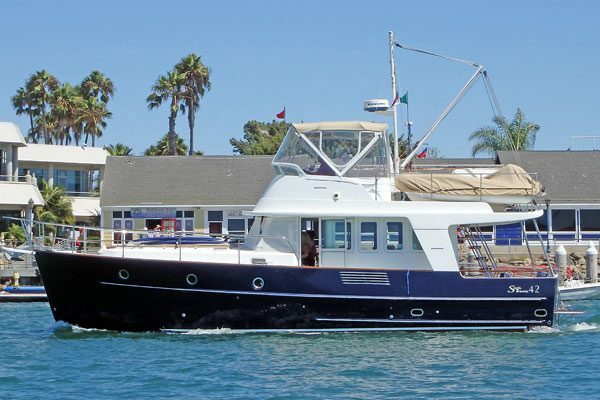 For several years, Jeff Merrill has presented seminars at PassageMaker magazine TrawlerFest events around the U. S. and shared his “Performance Prediction” spread sheet as a class hand out. Now JMYS is making this spread sheet available on our website for everyone to download. 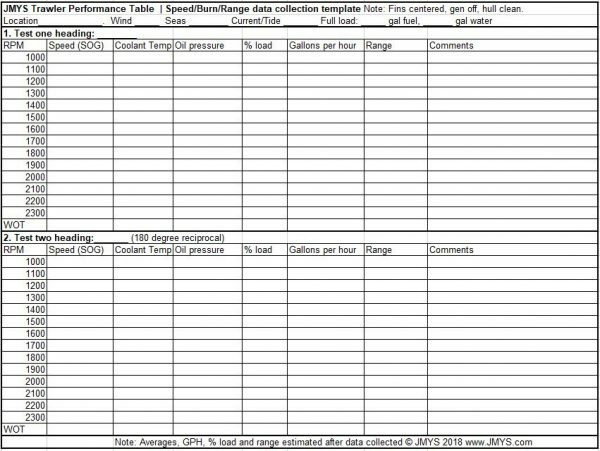 This is a very simple excel/numbers spread sheet that is designed to measure your speed through the water, fuel burn and key engine performance characteristics at RPM’s in increments of 100. With a clean hull bottom and your trawler loaded into normal cruise mode with fuel, provisions, gear, etc., we suggest you head out to deep water (with no obstructions) and collect the data to fill in the cells on the performance prediction sheet. Get out in wide open water with about a mile clear for your forward heading and set up your heading on autopilot to steer a straight course. Begin as slow as you can, at idle, and then estimate the details to fill in the information cells. If you have a modern engine with fuel burn you can determine your gallons per hour. If you don’t have GPH electronically you can use the engine manufacturer data sheet to estimate fuel burn once you get back to the dock. After collecting your first 00 RPM data points, bump up the speed to the next 00 RPM, record the information and continue on up the scale until you achieve WOT (Wide Open Throttle). Obviously if there comes a time during your run where you need to abort to avoid a collision, make sure you remain safe, and if you need to start over it is better to be safe than sorry. With all of the spread sheet cells filled in one direction, slow down, turn 180 degrees and then repeat the process from idle to WOT. The reciprocal course will make sure that you have good data you can average. With two sets of data, you can then summarize your numbers at each 00 hundred RPM interval (add both numbers then divide by two) this will eliminate any influence of wind, tide, currents, etc. and give you a real world set of data points you can use to chart your trawlers performance. When you have crunched your numbers, you can then make more accurate travel plans, starting with the distance in miles you wish to travel, what speeds are optimum for fuel economy and you can realistically estimate your arrival time. Whether your trawler hull form is planning, semi-displacement or full displacement you will be able to calculate your “sweet spot” the optimum balance between speed and fuel burn and over time you will likely gravitate to that RPM as your go-to speed for the majority of your cruising. Even when you have an RPM that you favor, it is still a good idea to adjust your speed and RPM on occasion to keep your engine(s) running at their best and most flexible. Playing around with the numbers you can compare MPG (miles per gallon) vs. GPM (gallons per mile) and determine what your range and fuel burn is with a full load of fuel at various RPM’s. Long distance cruisers also allow for 10 – 15% in reserve (meaning they do their math to arrive with a reasonable amount of fuel left over) before heading out on long voyages. One last reminder; engines like to be run hard periodically. We know many owners who, when the coast is clear and typically near the end of the day, will run hard for 5 minutes or so to load up the engine and burn off soot, we endorse this practice as a good routine to follow.